Learning and working don’t blend seamlessly in most organizations — and part of the problem is the physical space. Many organizations are still operating within an Industrial Age paradigm, with only a small number having moved to the new era and new way of working, according to the book Future Work. The book features groundbreaking research on collaborative working trends and was a strong influence on the design of the new Center for Creative Leadership-EMEA headquarters, located in Brussels. Future Work describes the effective workplace of the 21st century as one that will blend learning environments with working environments — leading to organizations that are agile, competitive and capable of responding to changing market demands. In addition to its open floor plan, the campus provides dedicated spaces for reflection, creative thinking and leisure. CCL will also make full use of such technology as iPads to ensure the campus is not only a paperless office, but a paperless learning environment. 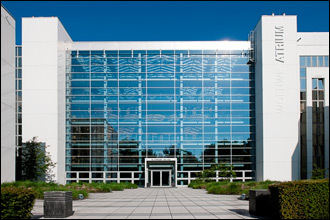 The new CCL-EMEA campus opened April 1. It is located at Rue Neerveld 101 – 103 Neerveldstraat, B-1200 Brussels, Belgium.